This CD contains songs by the seiyuu group Idol Boueitai Hummingbird. 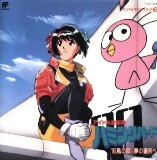 The CD front cover is a picture of Satsuki in her flight suit, sitting on the wing of her plane. 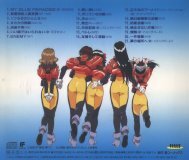 The back cover is a picture of the 5 girls' backs as they "walk away" in their flight suits. The 10-page booklet contains lyrics to the vocals, synopsis of the new OAVs, and line art of the Hummingbird girls and the Fever Girls. The vocals are mostly up-tempo songs, with the exception of Nakimushi no Mermaid and Yume no Basho he. I like all of the vocals. Yume no Basho he is my favorite, partly because it's Hummingbird's only ballad, but mostly because it's just a really pretty song. My current order of preference is 21, 19, 1, 12, 6, 15.